In view of this terrific fact, "Because there is wrath, beware lest He take thee away with His stroke." Sinners are even now threatened with God's wrath, yea, they are by nature "children of wrath." It is true that God's wrath now slumbereth for a while, because this is the day of salvation. It is true that the time for the full and final and open manifestation of it has not yet arrived. It is true that sinners often defy God now with apparent impugnity, and because of this the wicked spread themselves like green bay trees. "Therefore they say unto God, Depart from us; for we desire not the knowledge of Thy ways. What is the Almighty, that we should serve Him, and what profit should we have if we pray unto Him?" (Job. 21:14, 15). Let all such heed the Divine warning, "Because there is wrath, BEWARE lest He take thee away with His stroke." Sinner, be not deceived, God is not mocked. "O that they were wise, that they understood this, that they would consider their latter end! For their rock is not as our Rock, even our enemies themselves being judges. For their vine is of the vine of Sodom and of the fields of Gomorrah: their grapes are grapes of gall, their clusters are bitter. Their wine is the poison of dragons, and the cruel venom of asps. Is not this laid up in store with Me, and sealed up among My treasures? To Me belongeth vengeance and recompense; their foot shall slide in due time: for the day of their calamity is at hand, and the things that shall come upon them make haste" (Deut. 32:29, 31-35). The sinner is treading a path more slippery than ice, and unless he forsake it, in due time his foot shall slide. The bow of God's wrath is already bent: the arrow of His vengeance is even now fitted to the string, and nothing but His infinite forebearance stays its release. My reader, the only reason why you have not already been cast into Hell fire is because it has been the good pleasure of the Most High to stay your doom. Flee then from the wrath to come while there is yet time. "And thinketh thou this, O man that thou shalt escape the judgment of God?" (Rom. 2:3). Did Adam escape the judgment of God? Did Cain, did Pharaoh, did Achan, did Haman? The only reason God has not "taken thee away with His stroke" before this is because He endures with much long-suffering the vessels of wrath fitted to destruction. The time of the sinner's opportunity for fleeing from God's wrath is exceedingly brief and limited. The sad and tragic thing is that so few realize it. The sinner sees little cause for alarm and fails to apprehend his imperative need of promptly accepting Christ as his Saviour. He imagines himself secure. He goes on in his sin, and because judgment against an evil work is not executed speedily he increases in his boldness against God. But God's ways are different to ours. There is no need for God to be in a hurry - all eternity is at His disposal. When one man robs another, instantly the cry is raised, "Stop thief!" lest he should soon be out of reach. When a murder is committed the hounds of the law at once seek to track down the guilty One. A reward is offered lest he should succeed in escaping justice. But it is different with God. He is in no haste to execute judgment because He knows the sinner, cannot escape Him. It is impossible to flee out of His dominions! In due time every transgression and disobedience shall receive "a just recompense of reward." "Because there is wrath, beware lest He take thee away with His stroke, then a great ransom cannot deliver thee." Every member of Adam's race richly merits God's Wrath. Our sins which have mounted up to heaven; our profitless lives, spent in selfish gratification with no regard for God's glory; our indifference and carelessness respecting our soul's future welfare; our repeated refusals to respond to the invitations of God's grace, all cry aloud for judgment to descend upon us. But God's Mercy has provided a "Ransom" - a "covering" for sin - Christ! Our text speaks of this ransom as "great" - great in its value, great in its scope, great in its effectiveness, great because it delivers from so great a death and secures so great salvation. But great as this "ransom" is, it avails nothing for those who ignore and reject it. "Beware lest He take thee away with His stroke, then a great ransom cannot deliver thee." If this ransom be despised then there is no possible escape for the sinner. If Christ be rejected there remains nought but wrath. How this text shatters the "Larger Hope"! How it repudiates any possibility of a "Second Chance" in the next world! How effectually it closes the door of hope against all who die in their sins! Let the stroke of God remove such from this world and "then a great ransom cannot deliver" them. There are other Scriptures equally explicit. "He that being often reproved hardeneth his neck, shall suddenly be destroyed and that without remedy" (Prov. 29:1). For the sinner there is no remedy, no deliverance, no hope whatever beyond the grave. "Then a great ransom cannot deliver thee." Why? Because it is appointed unto man once to die, and after that - not a second chance, not a further probation - but the judgment. Why? Because at death the sinner goes immediately to Hell (Luke 16 :22, 23) and there there is no preaching of the Gospel and no Holy Spirit to quicken into newness of life. Why? Because there awaits all such nothing but "the resurrection of damnation" (John 5:29) and the judgment of the Great White Throne. "Then a great ransom cannot deliver thee." Why? Because repentance then will be too late. "Therefore will I also deal in fury: Mine eye shall not spare, neither will I have pity: and though they cry in Mine ears with a loud voice, yet will I not hear them! (Ezek. 8:18). Then a great ransom cannot deliver thee. Why? Because, Whosoever's name was not found written in the book of life, was cast into the Lake of Fire - and a "lake" has no outlet! Here then is a solemn warning against indifference, "Because there is wrath." Here is a solemn warning against procrastination, "Beware lest He take thee away with His stroke." Here is a solemn warning against hoping in another chance after death. "Then a great ransom cannot deliver thee." Here is a powerful plea for accepting Christ NOW. 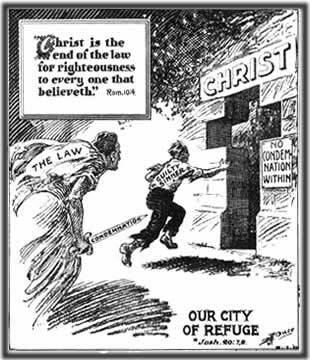 "How shall we escape if we neglect so great salvation?" We shall not! There will be no escape! Then "Seek ye the Lord while He may be found: Call ye upon Him while He is near."